Log on to BestPack.com now and enjoy huge savings on end of the year specials. The premiere taping machine manufacturer ends the year with a bang as it unveils irresistible money-saving deals. Now is the time to beef up packaging systems with effective and cost efficient solutions from the industry’s best. Take advantage of Section 179 before it expires! Purchase an MBD Case Sealer now for as low as $2,869 and save $1,100 off the retail price. California-based BestPack, premiere taping machine manufacturer and leading provider of complete packaging systems, gives customers the ultimate Holiday treat as it unveils a series of year-end specials. Purchase an MBD Case Sealer now for as low as $2,869 and save $1,100 off the retail price. The MBD Case Sealer is BestPack’s most economic taping machine model and is ideal for businesses requiring fast, effective and affordable packaging solutions especially this busy shopping season. Meanwhile, customers who purchase a pallet of machine roll carton sealing tape can receive a $100 voucher for spare tapehead parts and machine belts. The voucher can only be redeemed one-time and the amount is valid only for the cost of the specified parts, not including shipping and handling fees. It is also non-transferable and valid for 30 days. No balance is saved if the purchase made using the voucher is less than $100. More money-saving deals await customers as BestPack also offers the MSD Simple System—a cost saving “problem solver” for carton sealing applications. This taping machine system is definitely a workhorse and is the top selling MSD model top/bottom sealer. It has an in-feed and exit conveyor system, casters on all legs of the system, and a unique L-bracket carton stopper and carton holder. This amazing packaging solution is now available for a promotional price of only $4,955, which is a $1,100 discount off the retail price. The taping machine distributor is also giving away a free BestPack tapehead for every purchase of any BestPack carton sealer and a pallet of BestPack carton sealing tape or any two BestPack carton sealers. Save up to $1,185 on this deal alone. Each promo is valid until December 31, 2011 and is cannot be combined with other deals. Finally, customers are encouraged to take advantage of Section 179 before it expires. Business owners can deduct the full purchase price of equipment purchased during the tax year. Write off up to $500,000 and save thousands on packaging equipment for business. Log on to BestPack.com now to take advantage of these exciting year-end promotions. Customers can also contact their local BestPack representative for more information. Sign up for the newsletter to receive firsthand information on the latest deals and updates on taping machine systems and other products and services. Customers can also subscribe to the official company blog or follow BestPack on Facebook, Twitter and YouTube. BestPack is the total tape sealing solution with specially formulated lines of carton sealing tape, namely, Acrylic tape and Hot Melt tape, as well as 90 different models of carton sealing machines: carton sealers, case formers and case erectors. Press release produced by Cybertegic.com – an Internet marketing services agency that specializes in search engine optimized press release marketing (SEO Marketing) and Los Angeles based SEO services. 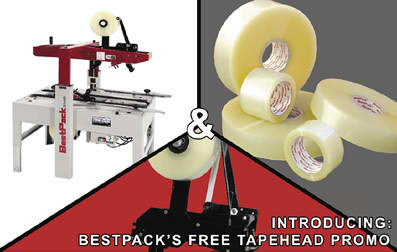 Receive a FREE BestPack Tapehead when you buy any BestPack taping machine and a pallet of BestPack carton sealing tape or any two BestPack taping machines. 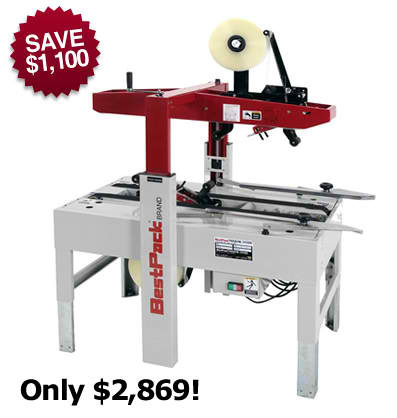 Purchase an MBD Case Sealer-BestPack's most economical taping machine-now for as low as $2,869 and save $1,100 off the retail price.